Instructions: My card size is 4 1/4 X 5 1/2". Make the card base and cover with pieces of the paper collection. I stamped the flower petals with Pink Peony ink then color with Pink Peony which gives you a monochromatic flower. I stamped the leaves and small flower sprays with black then colored with inks and cut out. 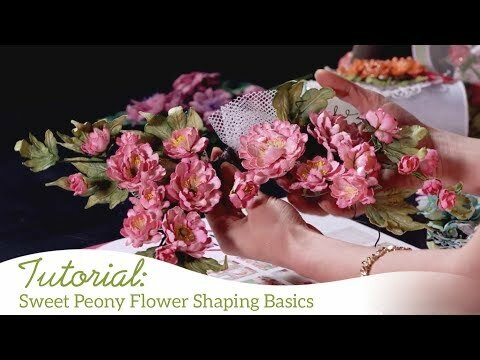 I also cut out the Peony at this time. 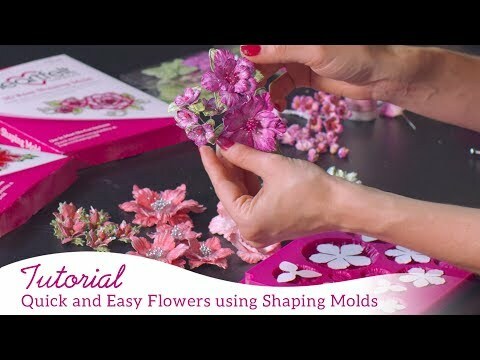 Shape the flower with the Floral basic shaping mold and then add some Crystal Clear to the edges of the peony. Set aside to dry. Stamp the sentiment onto a piece of white cardstock and edge with Berrylicious ink and add a half pearl. Next I found a sentiment on the paper collection and cut it out and glued it to one of the panels of the card. Now arrange the flowers and leaves and glue down. The card is ready to go.